Other transformations, such as square root or reciprocal, cannot be clearly interpreted and are best avoided. However, rather than use a logarithmic transformation, it is usually easier to use the ratio of the measurements or the difference expressed as a percentage of the mean. On the Fit Differences task pane, in the D drop-down list, select Ratio. The difference plot shows the ratio of the measurements with the points now forming a constant-width band across the measuring interval. 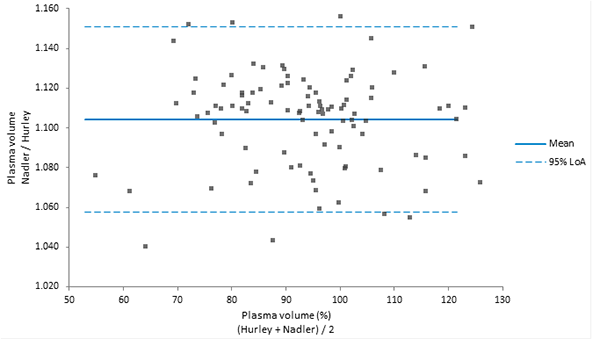 The mean ratio estimate is 1.10, which indicates that the Nadler method measures an average of 10% higher than the Hurley method. The limits of agreement indicate that the Nadler method may measure between ~6% to ~15% above the Hurley method for 95% of measurements.